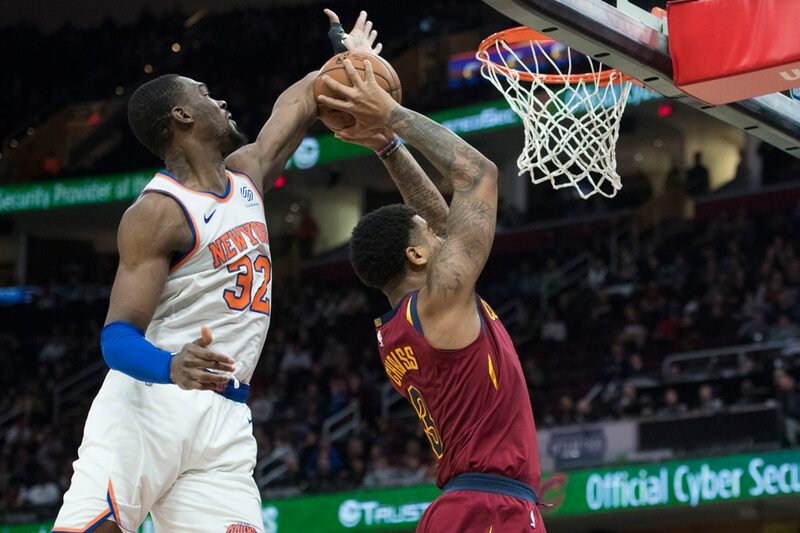 The New York Knicks made an ignoble bit of history Monday night, when their late comeback fell short in a 107-104 loss to the host Cleveland Cavaliers. The Knicks, who trailed wire-to-wire but had chances to tie the score or take the lead in the final minute, have lost 17 straight games -- the longest single-season losing streak in franchise history. New York lost 16 straight games during the 2014-15 season. The Knicks lost 20 straight games spanning two seasons over 1984-85 and 1985-86. At 10-46, the Knicks have the worst record in the NBA, a game worse than the Phoenix Suns and 1 1/2 games below the Cavaliers, who snapped a four-game losing streak Monday with just their fourth win in the last 26 games. The NBA's bottom three teams will all have an equal chance at winning the NBA draft lottery in May. Collin Sexton scored a team-high 20 points for the Cavaliers while Larry Nance Jr. registered a double-double with 15 points and 16 rebounds. Jordan Clarkson had 15 points and Kevin Lowe scored 14 points in 16 minutes, including the first five of Cleveland's game-opening 8-0 run, Marquese Chriss (14 points) and Matthew Dellavedova (12 points) also scored in double figures. Kadeem Allen scored a career-high 25 points off the bench for the Knicks while DeAndre Jordan had a double-double with 12 points and 10 rebounds. Kevin Knox scored 13 points while Dennis Smith Jr. and Mitchell Robinson each finished with 10 points. The Cavaliers opened up double-digit leads in all four quarters. The Knicks twice got to within one point in the first and closed to within two, at 36-34, on Noah Vonieh's dunk with 8:03 left in the second quarter. That was as close as the Knicks would get until Luke Kornet's 3-pointer with 52.8 seconds left narrowed the Cavaliers' lead to 105-104. Dellavedova missed a 3-pointer on Cleveland's next trip, but Kornet misfired on an open 3-pointer with 21.8 seconds remaining. Sexton hit two free throws with 17.3 seconds left and John Jenkins and Smith each missed 3-pointers in the final eight seconds.